Ring Hooks are brackets to safely anchor rings or ropes to your Singular WOD structure. They are made from structural steel and have a stove-lacquered powder paint coating. They are easily installed with screws, requiring a perforated arcade for mounting. With them you can anchor both rings andclimbing ropes. Wooden rings for gymnastics and gymnastic movements for functional training. Easy and safe height adjustment. 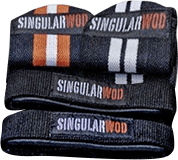 Side extension for Singular WOD structures Use it to hang rings or ropes.